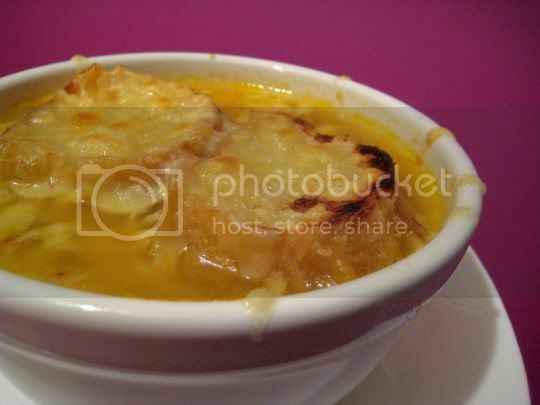 One taste of this, and you'll never eat "regular" French onion soup again! Not only is this version of the classic soup vegetarian, but it's low fat...and you'd never believe either! It's so richly flavored, with the perfect balance of sweet and savory. Melted cheese on top adds the perfect amount of saltiness and creaminess, and broiled long enough, you get that smoky, roasted, burnt cheese flavor that goes so well with the sweetness of the soup. The bread (use thick slices) soaks up the soup and adds a nice heartiness to the dish. While I would definitely say this dish is worth the time, you'd better get ready to caramelize a ton of onions (3 pounds worth). I've caramelized onions once before, and they actually caramelized. The way this recipe suggests the process, however, did NOT yield perfectly caramelized onions. They took longer than the suggested hour of cooking time, and they didn't even brown! For some reason, the onions stayed very liquidy: so first thing's first, I'd suggest raising the cooking heat from "very low" to "medium-low." I turned up the heat halfway through (when I realized I wasn't getting the desired brown color), and I wish I would have done so sooner. Even after about an hour and a half of cooking time, the onions still weren't browned...but oh were they smelling and tasting good. So sweet, so rich! Next, add vegetable broth, sherry (for that fragrant alcohol aroma and taste), and just a touch of Dijon mustard for a little bite. This is simmered for another 15 minutes, and a splash of sherry vinegar is stirred in at the end. Ladle into ovenproof bowls, top with a couple slices of sourdough, and sprinkle generously with cheese. The recipe suggested Jarlsberg or gruyere, but I went with the first, seeing as how half a pound of gruyere was $15 (!!!). Broil for a few minutes, and enjoy! This soup is amazing, but I think it's missing just a hint of an herbal note: try maybe some thyme, marjoram, or maybe even a little sage. Also, while the Jarlsberg worked well, I think a nuttier, stronger cheese would have added extra oomph: go for the gruyere! Make again? Definitely. An instant veggie classic!